Two weeks ago, I mused about chestnut perfumes. The topic must still be on my mind, because I just unearthed a vial of Aroma M Geisha Marron in a bag of samples on my desk and decided to give it another spin. Geisha Marron was originally released as an oil (in a roll-on bottle) in 2006, but Aroma M's founder and perfumer, Maria McElroy, launched a new Eau de Parfum concentration in 2017. Like its "sisters" in the Geisha collection, Marron is an interpretation of a color —in this case, brown. Its composition includes notes of grapefruit, mandarin, bergamot, muguet, chestnut blossom, magnolia, leather and musk, combined to make Geisha Marron a spiced fruity-floral fragrance that would be a good introduction to the rest of the line. On my skin, Marron lives up to its description as the "scent of succulent overripeness, of sweetness that dares to skirt the edge of seductive decay." It starts off with an accord that reminds me of candied nuts, sort of sugared and woody at the same time. However, Marron isn't a purely gourmand fragrance: the blossoms of the chestnut tree end up playing a stronger role than its nuts. The white florals are creamy rather than indolic, and the fruit notes remind me of overripe peaches. The fragrance's dry down is a fruity amber with hints of honey and patchouli. I used to have a sample of Geisha Marron in its original perfume oil concentration, and this new Eau de Parfum feels airier and a little brighter to me, like the composition has been given space to stretch out and let the light in. It doesn't last as long on my skin as the oil used to, but that's to be expected of an alcohol-based version. It cheered me up on a windy gray day the way a colorful patterned scarf might do. Geisha Marron won't replace Geisha Violet or Nobara-Cha as my Aroma M favorite, but I like its feeling of easygoing chic. I'd recommend it to women who are just starting to explore niche or indie fragrances, since it's so wearable and smooth, without the quirk of Geisha Green or the drama of Geisha Noire — although I'd hope that they'd work their way up to those, too! 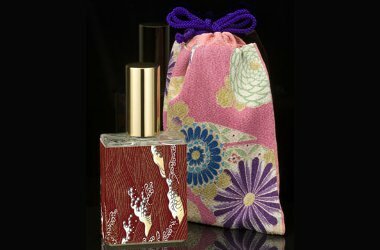 Aroma M Geisha Marron is available in 50 ml Eau de Parfum ($100) or .25 oz. Perfume Oil roll-on ($60). For buying information, see the listing for Aroma M under Perfume Houses. 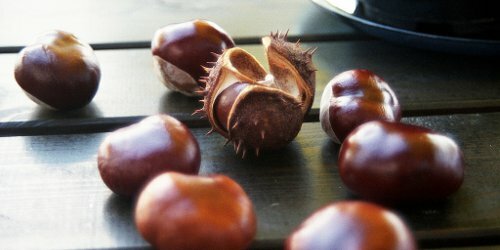 Note: top image is chestnuts [cropped] by Zaytsev Artem at flickr; some rights reserved. The price isn’t that bad either.. The packaging is beautiful for this house—traditional Japanese patterned papers! and you’re right, the price is very reasonable, esp for an indie brand that produces fragrances in small batches. Thanks for reviewing this! I’ve been curious about this one being a fan of Aroma M (just bought Nobara Cha oil. Love it!) Most user reviews seemed dissapointed that it was mostly a white fliral and not nutty or a straight up gourmand. I have no idea what chestnut blossoms smell like.. But I like her Camelia which also has that creamy white floral on the verge thing going on. Hey, that’s a good comparison…the white flowers here are not dissimilar to the ones in Camelia! I do agree that some of the original users expected a very nutty gourmand fragrance and they were turned off by all the flowers and fruit. Oops. Got to read the full description! I’m a big fan of the color brown, unless it’s an eyeliner. This sounds interesting to me. Is the honey and amber very pronounced though? I struggle with both of them. Thanks for the review! Well, it’s not a Honey Perfume in capital letters, but the amber is on the sweet side rather than the intense, spicy-resiny side, if that makes sense! Thank you for this review. I love wearing Geisha Vanilla Hinoki and have enjoyed sampling a few other scents from aroma M, a house I think deserves more love and attention. I’ve sworn off buying full bottles for now, so I added aroma M to my list of houses I’d like to sample from this year. The edge of decay is a great place to be. Dyptique 34 boulevard saint germain has a subtly overripe undercurrent that I find irresistible. Now I’m hankering after a sniff of Geisha Marron. It sounds delightful.